The evening was wonderful. 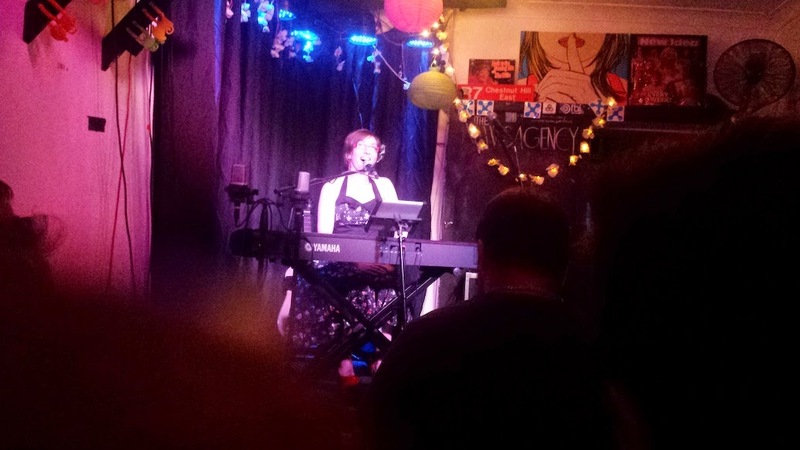 The little show that Helen Perris put on as part of her Pozible album-crowdfunding campaign was a treat. Thanks, Helen. When I got home and into bed last night, Ms T felt too warm. It passed, but you'll understand that given her suppressed immune system, fever is a constant threat. The last fever landed her in hospital. This, I hope, will partly explain my reluctance – resistance – to being separated from her, a feeling I guess other carers might share, or at least understand. So why was I out of the house? For some months, the women in my life – Ms T and someone I've called “Sarah” in this blog – have been lobbying me about taking a break. They talk about “respite”, and we've talked for months about what form that might take. That's why I was at Helen's concert, rather than at home: Ms T learned it was happening and sent me out of the house, brooking no argument when I began getting cold feet. My fear of a fever should be enough to explain my reluctance, but it's not. There's also that which terrifies me to think, let alone to type. “Respite” has an undercurrent, an echo of the future reaching back to chill me. It's a rehearsal of the future I fear, the reason I cling so tightly, the day when I go somewhere alone because I must. Other carers, I hope, will understand: “Can't you take a break?” – “No”, because we're superstitious that mere absence will bring a crisis, that we're fearful that the crisis isn't next year, but now. That the words “taking a break” feel like the beginning of the longest break of all. “Taking a break” means breaking a link to the past and life that once defined Ms T and I. Across the road from The Newsagency is the Victoria on the Park, where our elder son danced in Ms T's womb while I worked the desk for early-90s Sydney bands and we would taxi home at 2am to sleep until midday on Sunday. A pang of nostalgia is surely to be expected. I loved the performance, and I managed to keep my tears and my fears to myself. There was no crisis, and this morning's breakfast pancakes look nearly perfect. Perhaps respite will do me good; I just wish it didn't hurt so badly.